Newly retired Group 1 winner Ulysses, who was raced by the Niarchos family and who will stand the upcoming breeding season at Cheveley Park Stud for a fee of £30,000, gained two high-quality mates from Monday's Fasig-Tipton November sale, including the $2 million mare Mesa Fresca. Chris Richardson, Cheveley Park managing director, went to what he described as his limit to acquire the ten-year-old daughter of Sky Mesa, who already has produced Grade 1 Del Mar Oaks winner Harmonize. "She was in foal to War Front, and that was a big factor," Richardson said. "She's a proven producer and a mare we just fell in love with. It's a lot of money, I know, but it's a pedigree you can't acquire in England, and we're very excited to have her." Mesa Fresca is from the outstanding female family of US champion Queena and she is a half-sister to the dam of graded winner Al Khali and stakes winners Japan and Sheikhali. The family also includes Grade 1 winner and promising young Coolmore stallion Verrazano. Richardson said he was not yet sure of what other mares Cheveley Park will send to Ulysses, but the Fasig-Tipton sale quickly yielded a second jewel for the Coral-Eclipse and Juddmonte International Stakes winner when the Niarchos family’s Flaxman Holdings bought Graded stakes winner Mississippi Delta for $700,000. By Giant's Causeway, five-year-old Mississippi Delta earned $731,638 in her recently completed racing career. Her dam is a half-sister to million-dollar earner and sire Cowboy Cal, and the family includes Grade 1 winners Behrens and Commentator. 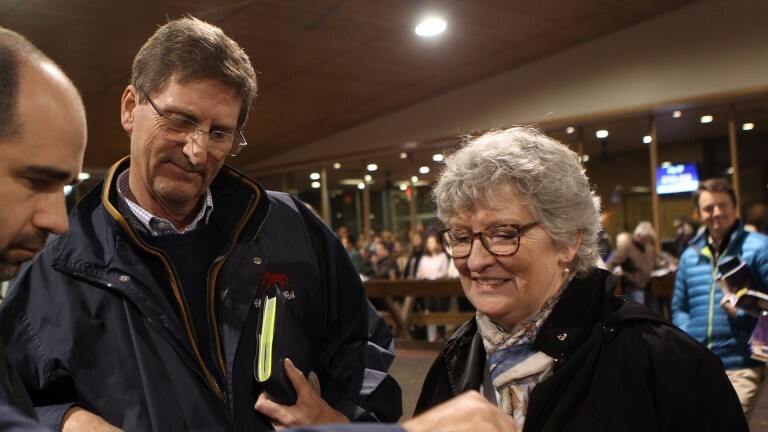 "Maria [Niarchos-Gouaze] wanted to find some nice mares to breed to Ulysses and we were lucky to get Mississippi Delta," said Alan Cooper, the Niarchos family's racing manager. "We're looking forward to sending her to Ireland first, and then she'll go over for the covering season to Cheveley Park." While the family has not completed its matings plans for next year, Cooper said that Ulysses will be supported with quality Niarchos mares. "His potential at this stage is great. He's a very special horse to be around in terms of his temperament and character - he's got exceptional class," Cooper said. Ulysses also is special to the Niarchos family because his great granddam, Northern Trick, was acquired by Stavros Niarchos as a yearling in 1982 and has been an outstanding foundation mare. "The family is still producing top racehorses," Cooper observed. "Now we have to find another one for the racing stable."